We arrived at Hanoi airport at 9am yesterday. It feels like a lot more than 36 hours ago, we’ve experienced so much. First impressions weren’t great. I’ll be honest, all I wanted to do for the first 3 hours was leave. To begin with, our bags took over an hour an a half (longer than the flight from Bangkok) to make it to the carousel. Somewhat frustrating but it happens. We stepped out of the airport and I couldn’t help but notice the ubiquitous smog-grey Hanoi sky. Urgh. The taxi ride from the airport to the Old Quarter was hair-raising. I take back anything and everything I ever said about Thai roads and drivers. I couldn’t watch as we came within centimetres of families on motorcycles, ladies carrying fruit on poles, other cars, buses. The thought of having to be on foot in all that was mind-boggling. We had booked our hotel from the airport after discovering that the one we’d been recommended by Ms Muppet was full (obviously a good recommendation – wish we’d thought about it earlier!) and were happy to discover very helpful, English-speaking staff who gave us a map, wrote down phrases in Vietnamese and recommended things to see and do, as well as how to keep our belongings safe. Then, exhausted from our early start, I had a sleep while Luke did some editing. In the afternoon we decided to take a walk around the nearby lake. This necessitated some road navigation. It is difficult to put into words the experience of crossing a road here. The traffic is 1% bus, 14% car and perhaps 85% bikes and motorbikes. There are no lanes, although people mostly drive on the right. When the road narrows it’s pretty much a free-for-all. Before coming here I was feeling quite frightened about getting around, envisaging myself bound to whatever block my hotel was on but it’s nowhere near that bad. The traffic is slow but continuous. Kat’s recommendation to think of oneself as an island, is pretty accurate. If you step out anywhere and just walk slowly and in a straight line, it seems pretty safe. But don’t even think about walking along most of the footpaths. These seem to function more commonly as a parking area, storeroom, restaurant or loungeroom and no one is moving out of the way for anyone. Just walk on the road, it’s easier. We made it the the lake and surrounding park, and it was a sad sight to see. A dead fish in the water, pitiful gardens and small patches of grass cordoned off so you couldn’t stand on them – which was understandable considering the thousands of people all trying to take a leisurely stroll. There were few seats, many people trying to sell fruit, fans, hats, taxi rides, stamps… everything! However, after spending more time here I can appreciate the fact that the walk around the lake is far less harrowing than walking around the streets. Full of wonder at the sheer busyness of everything, we walked up the 5 flights of the ‘shark building’ to the City View Cafe, where we had an excellent view of the mayhem below. We people watched from there and also noted the great numbers of dragonflies circling the building – more than I’ve ever seen in one place in my life. As luck would have it, when I took this photo there was virtually no traffic. I promise you that at all other times it is an ocean of vehicles! That evening we headed for the night market, only a few blocks from our hotel. It was a series of stalls on a blocked-off street that stretched about a kilometre. Sadly, the stall sold mostly tat. Cheap looking clothes, electronics, rubbish jewellery. More interesting were the food vendors. An old lady gave us a bit of fruit to try. I’m still not sure precisely what it was, although I bought a bag of them. It tasted mildly sweet with a consistency like apple crossed with potato. It must be popular here because about 100 ladies were selling them. There were also sausages on sticks (felt a bit hesitant about these), delicious pastries on sticks (no hesitation here at all) and various noodles with mystery-meat. The mystery fruit/nut/vegetable. Water chestnuts? By the end of the road I was getting hungry so we found a street restaurant and took our chances. They set us up at a table on the footpath, and by table I mean something plastic that would be more at home in a 5 year old’s cubby house. All the street furniture here is tiny – as is the space in which it needs to fit. It wasn’t uncomfortable though. We were given a platter of raw meat and vegetables and they lit up a small hot plate for us to cook the food ourselves. It was pretty much like Korean BBQs but for $4 each. Luke, unfortunately, got hit in the eye with a drop of boiling oil (no permanent damage done!) but you’ll be happy to hear that I caught it on camera. Whew! The seasoning for the cooked items was a small bowl of salt, pepper and sliced chilli that we squeezed fresh lime juice over. I really liked that – must remember to try in on the bbq when we get home. As we sat there at dinner, being laughed at by the waiter, I thought ‘I like this… and I don’t know why’. It was dirty, smelly, there were motorbikes half a metre away and trains rattling by overhead but there was something about it. Probably the sheer strangeness of it all. 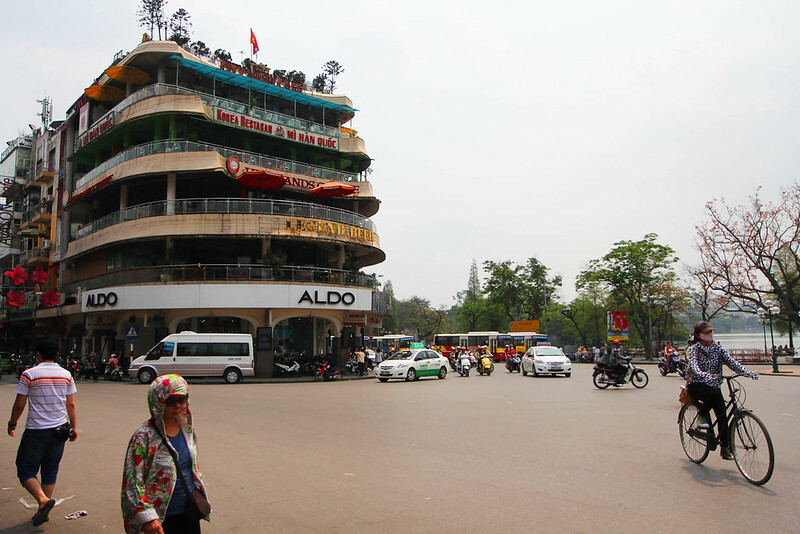 In Hanoi you feel like you can’t get much further from suburban Australia and so, at least for a while, it’s definitely fun. I also like the fact that I’m being challenged and succeeding at things I wasn’t sure I could do. Asia has been a definite step our of my comfort zone and I like that. Hanoi reminds me of a certain person in my life, who doesn’t try to give you the best impression of them on the first meeting… in fact many people find this person quite abrasive. And yet the longer you know them the more the good becomes apparent and the rewards of knowing them are felt. 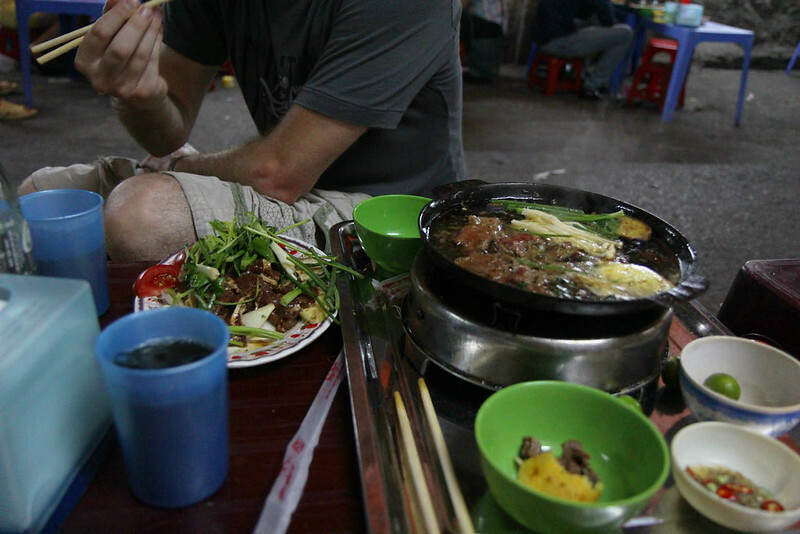 As I said to Luke, “Hanoi is a city that can only get better’. And it did! Being in a strange place is a wonderful experience I think, seeing things which are so foreign and trying to adapt to local ways of doing things. One of my favorite things about being in Japan is just how not-Australia is it. Yeah, just this guy I met in Canberra a while back;). Sitting on tiny plastic stools in the middle of bustling streets, eating strange food that I’ve just seen cooked in front of me on a ghetto cooking set up, form some of my favourite memories of Asia. 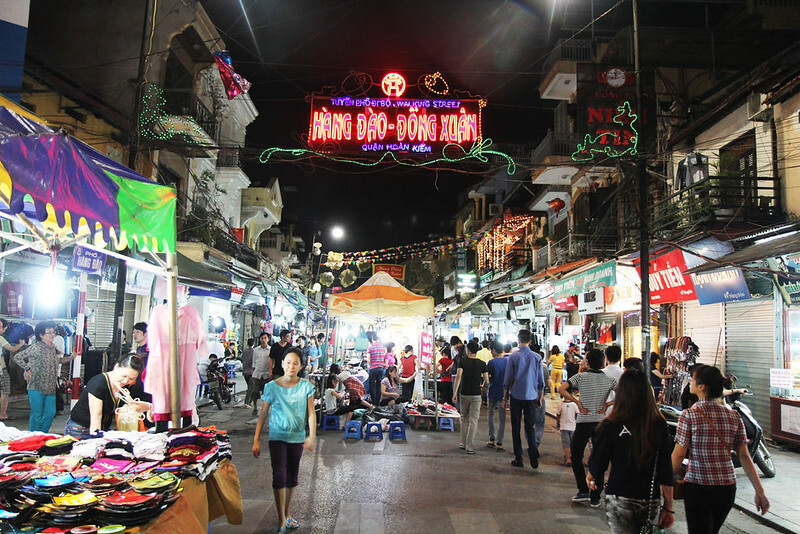 There was a tiny alley next to that hotel I recommended, and every morning I’d go there and sit on the ground and eat a breakfast of fried tofu, noodles, vietnamese mint and chilli sauce – cost about 50c. Shame that hotel was full, it must be going well – it was fairly quiet when I was there, but then again it is quite small. I’d love to stay there again!